What we should say about this song, now all the appreciation for Alia Bhatt and how she has just nailed the song. Mind-blowing, just mind-blowing, what Alia had done in this song has really put a milestone in her career that will be remembered for ages. The first song of Kalank, Ghar More Pardesiya is all about making you too excited for the film. The song starts with the beautiful sets and picturization, and then it shows Madhuri Dixit singing the song and narrating the story of Ramayana. Then we see Alia and Varun are just a little away to each other. As soon the moment goes Alia enters Madhuri's place where she is teaching dancing and singing to women. Here Alia joins to Madhuri with some musical battle and soon it turns into a dancing face-off where Alia just killed it. The way Alia has performed Kathak in the song is brilliant and it becomes more special when she is doing it in front of Madhuri Dixit. 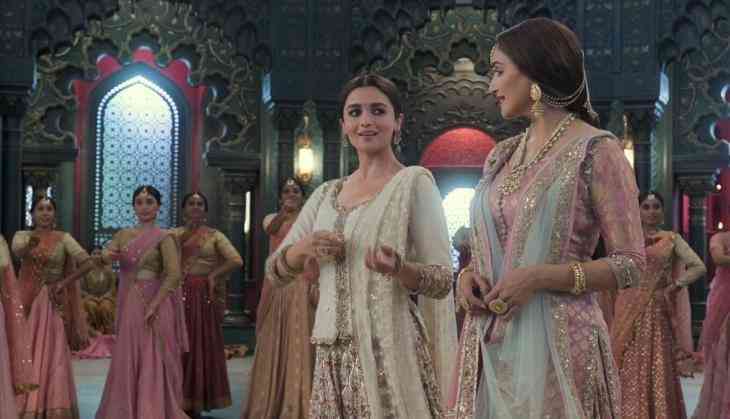 All praise for the choreographer Remo D'Souza and singers Shreya Ghoshal, Vaishali Mhade, and captain fo the ship Kalank, director Abhishek Varman. They all have given this song an amazing touch that made it one of the best songs in Bollywood ever. The film is slated to hit the screens on 17th April 2019. जानिए पीएम मोदी की मां के लाइन में लगने पर विपक्ष की क्या है 'लाइन'?